Stephen Sondheim is backpedaling a bit on what changes fans can expect in the movie adaptation of Into the Woods. In a New Yorker article last week, Sondheim said that the sexual encounter between the Baker’s Wife and the Prince had been cut, which also meant cutting the song “Any Moment.” Now he’s, er, changed his tune. He released a statement today that says “Any Moment” is, in fact, in the film. An article in The New Yorker misreporting my “Master Class” conversation about censorship in our schools with seventeen teachers from the Academy for Teachers a couple of weeks ago has created some false impressions about my collaboration with the Disney Studio on the film version of Into the Woods. The fact is that James [Lapine, who wrote both the show and the movie] and I worked out every change from stage to screen with the producers and with Rob Marshall, the director. Despite what the New Yorker article may convey, the collaboration was genuinely collaborative and always productive. 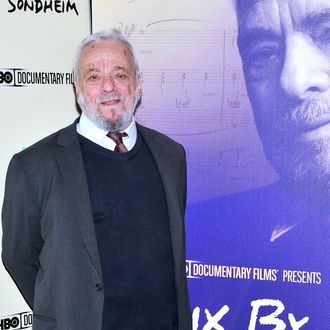 “Any Moment” was not the only change Sondheim reportedly mentioned last week: The New Yorker article also quotes him as saying that Rapunzel does not die in the film (which she does in the show), and that Disney had some problems with the sexual predation between the Wolf and Little Red Riding Hood. His statement makes no mention of those changes, so make of that what you will. If the movie turns out not to be very good, someone is going to have to write a version of “Your Fault” between Sondheim, Lapine, Disney executives, and Meryl Streep. Feel free to get a jump-start on that now.